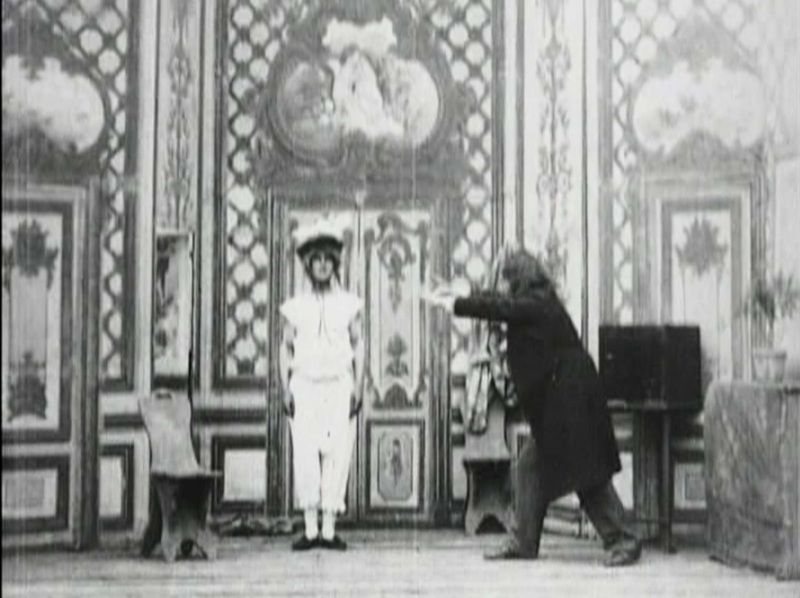 Again working on a sound stage, Alice Guy gives us her interpretation of a “trick” film a la Georges Méliès. It seems she was aware of what others were doing and happy to copy their style, even as a little of her own personality seems to slip in here and there. This movie takes place on a single stage, the backdrop suggesting a comfortable middle-class apartment in Paris. A woman is shown in to the room and a man with a beard and long black coat motions her to sit. He then waves his hands and she becomes suddenly stiff. He makes her stand erect, then waves his hands and suddenly she is standing in her underwear – the hypnotist now has her clothing! He hangs up her dress and shawl and again begins to gesture magically, when suddenly another man, dressed as a soldier bursts in. He appears to remonstrate with the hypnotist, who demonstrates that he can re-clothe the woman simply by throwing the clothes at her, but then he undresses her magically again. The soldier becomes more aggravated, and the hypnotist throws the dress at him – suddenly the woman is wearing his uniform, and he is wearing her shawl! She is suddenly awake and a chase scene begins with the woman, the soldier, the hypnotist and his servant. They run out of the room and back in again. This seems like a somewhat lame imitation of Méliès, with a very basic plot and minimal production value. The stage is obviously false, and the camera is set to see the entire bodies and with a great deal of fairly uninteresting space above the actors’ heads. It doesn’t move and there are no edits, except those allowing for the tricks to be enacted. There does seem to be mild titillation going on – although the woman in her underwear is far more chaste than the boys we saw bathing in their trunks. The soldier is evidently an angry husband or suitor, and we must leave to our imaginations what the hypnotist might have done if not interrupted. the characters gesture a great deal, but somehow their performances lack the madcap silliness of Méliès. You can watch it for free: here (with music).